What if Peter Parker never got off the bus in Infinity War? That's the basis of the new Avengers: Endgame fan theory that believes some trickery will go on to make it seem like Thanos never attacked Earth. 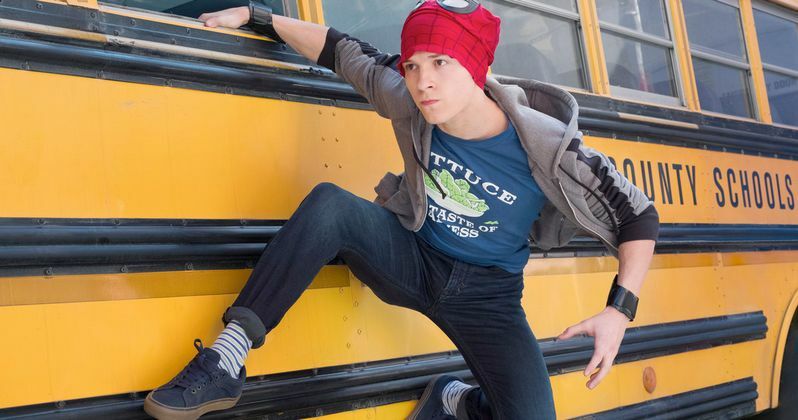 The trailer for Spider-Man: Far From Home debuted this week and Marvel Cinematic Universe fans have been picking it apart to figure out how Peter Parker makes it back for the sequel. Marvel Studios boss has said that Far From Home takes place minutes after Avengers: Endgame. The latest Avengers: Endgame fan theory uses Kevin Feige's words on Spider-Man: Far from Home as its basis. Thanos achieves his goal at the end of Infinity War and Decimates half of the universe, including Peter Parker, who was seen using the Iron Spider costume throughout the movie. However, Parker is shown using the original Spider-Man suit in the Spider-Man: Far From Home trailer, which leads one to believe that Thanos' attack on Earth may have never happened. If Thanos' Black Order never came to Earth, then Peter Parker never got off of the school bus on his field trip to the Museum of Modern Art. This could be how Spider-Man: Far From Home starts minutes after Avengers: Endgame. Parker never received the Iron Spider suit and never had to go investigate the Q ship above New York. But how does this happen? From there, the theory goes back to Titan where Thanos and Tony Stark are battling to the death and Doctor Strange gives up the Time Stone to spare Stark's life. During the battle on Titan, Thanos tells Tony Stark, "I hope they remember you." The line at the time sounded fitting because it looked like Stark was going to be killed. But, when looked at it another way, perhaps Stark sacrifices himself in order to make it where the Mad Titan never started his quest for the Infinity Stones. When looked at in that light, it's possible that people wouldn't even know about Stark's sacrifice to save half of the universe. Obviously this is just a fun theory to discuss and isn't based on anything official, just the trailer for Spider-Man: Far From Home. Even looking at this particular Avengers: Endgame fan theory, it doesn't try to explain how the Avengers are able to reverse the Decimation, if at all. There have been numerous theories about that already, mostly having to do with Scott Lang and the Quantum Realm and some form of either time travel or multiple dimensions. Whatever the case may be, Marvel Studios has created a pretty awesome fan community that sparks creative discussion and maybe even finds a few links that nobody has figured out yet. In the end, all we can do is wait for the end of April to come along. Until then, you can head over to Reddit to check out the original theory.